We offer a variety of badge and button making accessories to go along with your Badge-A-Minit 1 1/4" button machine, 2 1/4" button maker or 3" button machine. Give pin-back buttons some extra punch by adding a rosette and/or ribbons. 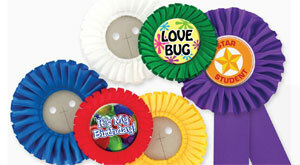 Perfect for awards or honoring a special guest, rosettes provide a celebratory touch. Want to expand your hand press or bench press button-making capabilities? Get an extra set of assembly rings. If you want to make your own button designs, our Button Maker software provides templates and a variety of clip art to get you started.